Like most vitamins, Vitamin B12 plays a vital role in our metabolism. 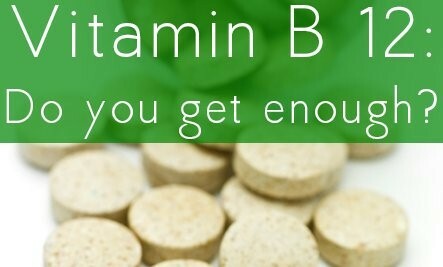 This vitamin is essential for the manufacture of red blood cells whose deficiency results in a kind of anemia.Vitamin B12 is needed to support the normal function of nerve cells, and to manufacture myelin, the insulating material that surrounds some of our nerve cells and speeds neural transmission. It is also required for the replication of DNA. Called the energy vitamin, inadequate B12 intake makes a dent in red blood cell production, and some of the earliest signs of a deficiency include feeling dragged, confused, and weak. Low B12 levels prevent the brain from working normally that results in chronic fatigue. The most serious manifestation of B12 deficiency is impaired brain function, due to the effects of B12 on nerve cells. Advanced B12 deficiency causes dementia severe enough to resemble Alzheimer’s disease. Long-term use of acid-reducing drugs. Stomach acids help break down animal proteins that have vitamin B12. This vital vitamin is only found in animal products like eggs, meat, shellfish, dairy and fortified cereals. Up to 15% of people don’t get sufficient B12, and they’re more likely to be vegetarians, have Celiac disease or other digestion problems, or be an adult over 50. Recent studies have revealed that a significant portion of adults particularly vegans, are deficient in Vitamin B12. Older individuals also often have poorer appetites and food intakes, and they may be on medications (for heartburn) that can further reduce stomach acid levels. As a result, some seniors actually lose the ability to absorb vitamin B12 from food at all, and must get it via supplements or, if the deficiency is severe, injections. To get into the bloodstream, B12 must be escorted by a protein called intrinsic factor, produced by cells of the stomach. Many disorders of the stomach, such as gastritis, particularly common after age 50, can interfere with the production of intrinsic factor. This condition is called pernicious anemia. Medications that affect the stomach – such as aspirin, antacids and proton-pump inhibitors – can also interfere with intrinsic factor production and result in B12 deficiency. The commonly used diabetes medication, metformin (Glucophage), can do so as well. If you don’t eat animal products, or you have a medical condition that limits how well your body absorbs nutrients, experts recommend taking a B12-containing multivitamin and eating breakfast cereal fortified with vitamin B12. In the case of B12 deficiency, due to inadequate intake from food, oral supplementation suffices to fix the problem. But pernicious anemia cannot be treated with oral B12, because the lack of intrinsic factor will prevent absorption. The appropriate treatment is B12 injections B12 injections are essentially painless and provide nearly 100 percent delivery by by-passing the digestive system. The heart and entire cardiovascular system needs B12. One of its jobs is to remove a dangerous protein called homocysteine from the blood. If homocysteine is allowed to roam through blood, it damages your arteries leading to inflammation and heart disease. With sufficient B12, you can keep the homocysteine levels down and thus maintain cardiac health. Your nerves have a protective covering to keep them safe from toxins and free radicals in your blood. Without these coverings, called myelin sheaths, exposed nerves get damaged and may even die. These dead nerves disrupt signals to and from the brain and may play a role in nerve-related conditions. Vitamin B12 supports the way your body replenishes this protective covering. Brain uses a chemical called serotonin to regulate your mood. If you aren’t getting enough B12, you may find yourself feeling down. One study of diabetic patients experiencing side effects of depression from Metformin found those who took B12 enjoyed a more positive outlook. Some research suggests that cobalamin deficiency may cause a type of dementia in elderly patients that is in fact reversible with the right nutritional intervention. Generally, though, the dementia caused by B12 deficiency is completely reversible with supplementation. While folate can prevent B12-deficient anemia, it cannot prevent the dementia – only B12 itself can do that job. B12 supports DNA health, thereby keeping your cells younger. And when your cells are young, you look and feel young too. When B12 is deficient, our DNA cannot replicate normally – meaning we can’t generate new, healthy cells. As a result, vitamin B12 deficiency can mimic all of the effects of aging. Standard blood tests for serum B12 are unreliable because serum B12 does not accurately reflect intracellular concentrations. Elevated serum Methyl Malonic Acid (MMA) levels are a better indicator of B12 status because this occurs only if there is a B12 deficiency. However, improvement of symptoms with B12 supplementation is the best test.